Having scooped 10 Rwandan football league cups, seven Rwandan Peace cups and two CECAFA Kagame Cups, Jean Claude Ndoli is the most prolific footballer playing now in the current Rwandan league. He is also one of the most capped players in the Rwandan national football team (Amavubi). Jean Claude Ndoli, who plays on a loan for AS Kigali FC since the start of 2016-2017 Azam Rwanda Premier league from APR FC, joined APR FC in 2005 having played for Police FC for one and a half years. With APR FC, the 31-year-old goalkeeper won 10 Rwandan league cups from 2005 to 2016, seven Rwandan Peace cups and 2 CECAFA Interclub Kagame cups in 2007 and 2010. He also won other cups including the Lotto cup in 2007, the 25th RPF anniversary cup in 2012 and many other cups that APR FC participated in at the national level between 2005-2016. Jean Claude Ndoli is famous for his incredible shots and penalty saves. During his time at APR FC, Jean Claude Ndoli faced the toughest competition with Eric Ndayishimiye `Bakame’ for the regular starting place in the goal both in Amavubi and APR FC. Bakame, who joined APR FC in 2009 after leading the now defunct ATRACO FC to the CECAFA Kagame cup in Sudan, 2008, left Ndoli in APR FC in 2014 to join rivals Rayon Sports where he won the 2016 Rwandan national cup [Peace Cup]. Much as Bakame is one of the footballers that have been decorated many times in the Rwandan league, now having lifted five Rwandan cups, Ndoli remains in the lead. The five include three, with APR FC (2010, 2011 and 2012), with ATRACO FC in 2009 Rayon Sports in 2016 one each. He also earned four Rwandan league cups; three with APR FC (2010, 2011 and 2012) while one was with ATRACO FC in 2009. In addition, he won, with APR FC, the CECAFA Kagame cup in 2010. He told Taarifa in an exclusive interview, how he feels about his achievements. It is not a big thing to him. “I do not take it [Being the most prolific footballer in Rwanda] as a big thing because I achieved it as fulfillment of my duties, being a job that is a source of a livelihood for my family,” says Ndoli. Asked for factors behind his success, Ndoli says it was due to the confidence he had in the APR FC leaders and it was buttressed by the fact that he was the first Rwandan goalie in the national team. “I was the first Rwandan goalkeeper in the national team because this number had been for long dominated by foreign footballers and whose discipline was wanting in many aspects. I set my self a goal to be the goalkeeper of Amavubi and leave a legacy for being a player in the team for longest time, which will be a source of inspiration to my younger Rwandan brothers,” says Ndoli. He says the name “Ndoli” inspires him because his namesakes were Rwandan kings. Ruganzu II Ndoli is remembered for having liberated Rwanda from foreigners who had conquered it for 11 years. “Wearing the national jersey with that name [Ndoli] made me feel I had something unique to offer to my people whom I have always been confident of their support. It is this conviction, thus, that kept me high-spirited, passionate, patriotic and dedicated to do my best to serve my country,” says Ndoli. Having played for both Amavubi and APR FC for a long time, actually longer than other goalkeepers, Ndoli is trying his best to come to terms with the fate and setback Amavubi recently encountered when they failed to make it to the African Cup of Nations (AFCON), is the saddest memory he nurses to date. “I have participated in quite many football leagues including the AFCON qualifiers, CECAFA Senior Challenge cups, CHAN tournaments and many other games, but what makes me feel betrayed and restless until to date is the fact that we could not reach the AFCON finals despite all our huge efforts to be there,” says Ndoli. As to why Amavubi could not make it to AFCON qualifiers where it last participated in 2004, Ndoli points an accusing finger on some players who disappointed the team on the pitch. “There are times you could see a player working hard during the trainings, but on the pitch, he would be timid and less aggressive, disappointing the entire team who were more committed,” Ndoli could not name any of them but emphasized that, “They are many players who betrayed us’’. Hi dream: “To help my national team reach AFCON in the remaining three or five years of my football career. When this happens, I will be proud of having Rwanda reach AFCON before 2030 whether as a coach or an official at the decision-making level,” observes Ndoli. Asked to share any match he remembers during which he felt proud of his talent towards the team’s success, Ndoli, quickly, answers it was during the game Rwanda beat Morocco 3-1 at the Regional Stadium of Kigali, Nyamirambo in 2008. “Morocco got a penalty. All the spectators at the stadium stood up to welcome His Excellency Paul Kagame with a loud applause as he was entering the stadium. I said in my heart, `let me also salute my President by saving this penalty’ which I did”, proudly says Ndoli. Ndoli praises his teammates for playing with enthusiasm, commitment when they see the President in the stadium watching them play as one of the spectators. The 2011 CECAFA Senior Challenge cup final Amavubi lost to the Uganda Cranes is the worst encounter in my profession career ever, Ndoli recalls. 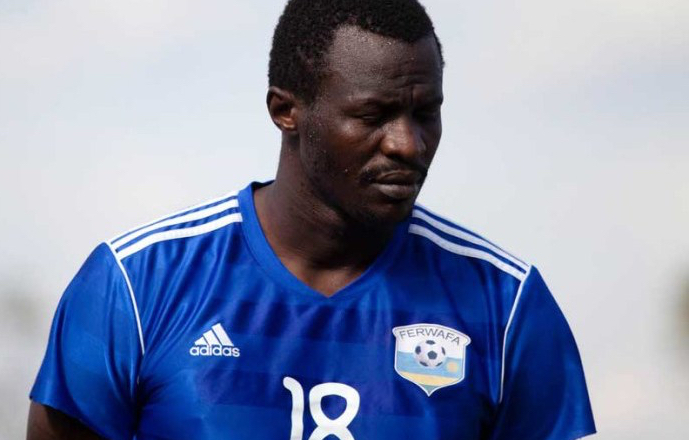 “I had saved so many shots by Ugandan strikers in the normal 90 minutes of the game which ended in a 2-2 score, we went in extra time and the result remained the same. When we entered in the penalty shoot-outs time, I saved two penalties but my fellow teammates lost three and Uganda won the cup. Remembering this game saddens me,” says Ndoli. As Amavubi goalkeeper, Ndoli says that Hamadi Ndikumana Katauti is his best defender, “You would always feel safe when Katauti was in front of you leading the defence”. Mbuyu Twite is his best full back he has played with at club level. Ndoli thinks his AS Kigali teammate Latif Bishira and Rayon Sports Abdul Rwatubyaye are the best defenders Rwanda has today while he sees Bugesera FC Olivier Kwizera as the most promising goalkeeper in Rwanda today and in the years to come. Ndoli is married and a father of three. Ndoli thanks Ambassador Lt-Gen (Rtd.) Caesar Kayizari who presided over the Rwandan football federation (FERWAFA) from 1995-2005, Ratomir Dujcovich the coach who led Amavubi to the AFCON 2004 in Tunisia, his coaches – Ndiki and Mutijima, Eric Nshimiyimana and Jean Marie Ntagwabira (RIP) as individuals who shaped his football career.